Jute & Canvas Bags There are 18 products. 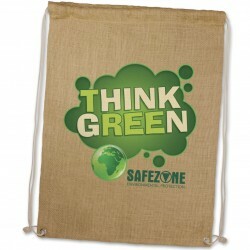 The unbleached jute net produce bag can be washed and reused many times. It is designed for transporting fruit and vegetables while allowing them to "breathe" so they arrive home in the best possible condition. 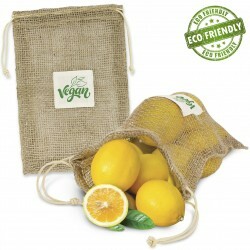 It has a drawstring closure, an unbleached cotton patch for branding and is compostable and biodegradable. Two bottle wine carrier manufactured from environmentally friendly, laminated natural jute with unbleached woven cotton handles. Delightful high fashion laminated natural jute tote bag with padded cotton handles. It has a rounded gusset and a sewn in base for added capacity. Carrera has a natural version as well as the choice of three dyed colours.